The Vaka Hotel Brno is located near the Kralovo Pole shopping mall. 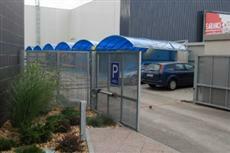 Nearby, guests will find such attractions as the Brno Exhibition Center. This Brno hotel is also located near the cultural and architectural sites that the city has to offer. The Vaka Hotel Brno is located only a few minutes away from the Brno airport. The airport and other attractions can be easily reached using Brno’s public bus system or by taxi or rental car. Each of the guestrooms at the Vaka Hotel Brno offers a kitchenette. Rooms also offer microwave ovens as well as televisions, safes, and high quality bedding. All rooms also include private bathrooms with tubs, showers, hair dryers, and irons. Guests of the Vaka Hotel Brno will find a shopping mall only a few steps away. There are a number of amenities offered onsite, including a salon and meeting rooms. The hotel also offers massage service as well as safes, laundry service, and dry cleaning.